One minute the stage is bare, then there’s a blackout, some noise, and suddenly the stage is full of…a poet. Not just a poet, but The Poet, the guy who is going to tell us the story of …not The Iliad but An Iliad. And what’s better than being told a story? 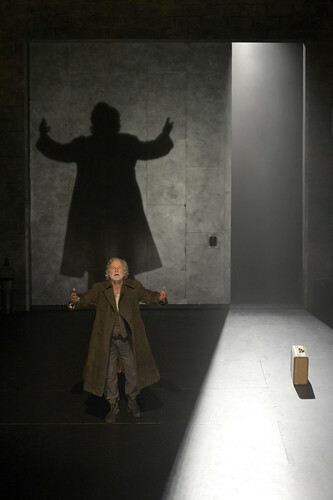 Nothing, especially when the teller is as dynamic and as bracing as Henry Woronicz, who plays The Poet in this adaption from Homer by Denis O’Hare and Lisa Peterson, who also directs. The language is muscular, bold and modern (and drawn from the Robert Fagles translation); it conjures the horrors of the Trojan War in vivid terms that are both epic and intimate. For an hour and 40 minutes, Woronicz fills Berkeley Repertory Theater’s Thrust Stage with an energetic accounting of warriors, heroes, cowards and the same futility of war nonsense that still colors every story of war, old or new. As handsome as this production is (a co-production with La Jolla Playhouse), with its austere, mostly bare stage by Rachel Hauck and its stunning, shadow-heavy lighting design by Scott Zielinski, I can’t say I was captivated. I wanted to be, but I never quite got there. Part of the reason is context, or lack of one. Why is this Poet spouting Homer? Why are we hearing The Iliad declaimed in this vague setting? Certainly stories don’t need context except the ones they conjure. And An Iliad takes us back to the battlefields of Troy with a few bolts of contemporary lightning thrown in to make sure we get the parallels. In one impressive (if overly emphatic) feat, The Poet recounts all the major wars in history, and later in the show, rattles off a list of global terrorism hot spots. We get it! War and terrorism have plagued civilization since there’s been civilization. But where did this guy come from and why is he talking to us, apart from the fact that tickets have been purchased and a show is expected? There were riveting moments in Woronicz’s performance, and then there were times when the text got convoluted and lost momentum. There were moments when the adaptation cut into something deep and resonant and then moments when it felt actorly and indulgent. The moment An Iliad became a play rather than just an enthusiastically told story was Brian Ellingsen’s arrival in the theater as he took to his perch above the stage to play his upright bass. He underscores much of the narrative and becomes for The Poet, a reaction, an audience, a conscience. Ellingsen brings out so much sound – beauty and cacophony – and such a variety of sound that it almost defies the logic. Is that really one person making such exquisite noise? Yes – one person and a tremendous sound design and composition by Mark Bennett. When The Poet first arrives, and before he begins his story in earnest, he says, “Every time I start this song I hope it’s the last time.” Why? Because it’s so painful and costs so much to tell? Or is he a tired wandering poet who wants to go home (or maybe land a part in a sitcom)? I know when dealing with the Greeks, we’re supposed to be highbrow and not ask such questions. The story is enough. This is timeless stuff, or so they say. Perhaps if I was more into the Greeks, if I knew my Menelaus from my Patroclus, I’d be more into about this adaptation. As it is, I’m appreciative if not enthusiastic. 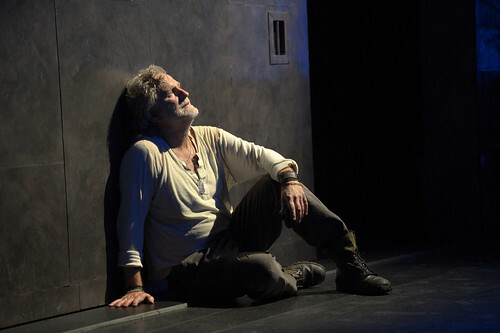 Lisa Peterson and Denis O’Hare’s An Iliad continues through Nov. 18 on Berkeley Repertory Theatre’s Thrust Stage, 2025 Addison St., Berkeley. Tickets are $14.50-$77, subject to change. Call 510-647-2949 or visit www.berkeleyrep.org.